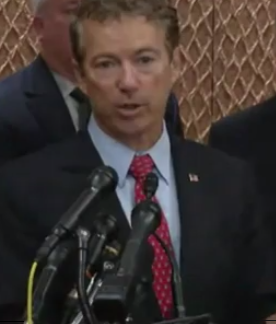 At a crowded Capitol Hill press conference today, Kentucky senator and presidential candidate Rand Paul (R) introduced legislation urging the president to declassify 28 pages on foreign government links to the 9/11 hijackers. Paul’s introduction of Senate Bill 1471—similar to House Resolution 14—represents a major milestone in the growth and visibility of the nonpartisan 28 pages movement. Furthering his pattern of collaborating across the aisle on national security and other issues, Paul has already garnered the cosponsorship of Democrats Ron Wyden (OR) and Kirsten Gillibrand (NY). Paul and Wyden famously teamed up last week to block the extension of PATRIOT Act provisions that enabled the NSA’s bulk collection of Americans’ phone data. 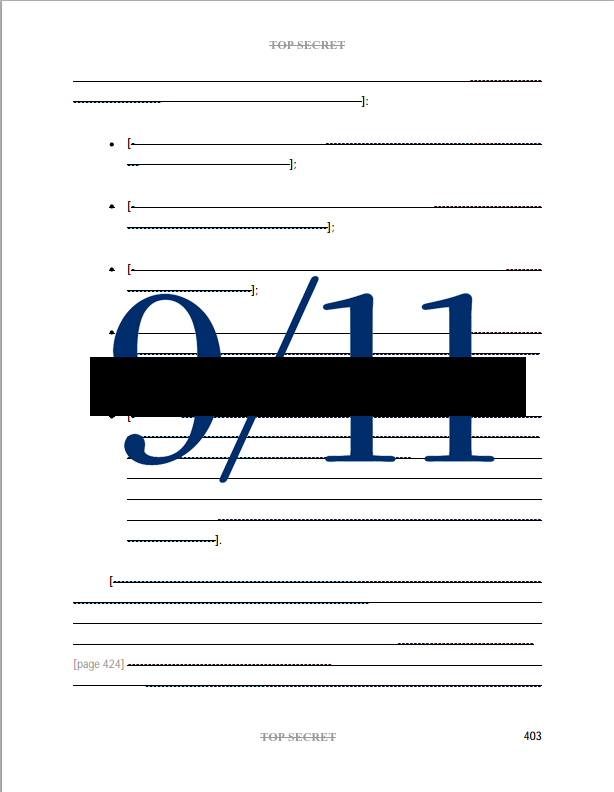 Saying he was not alone in calling for the pages to be released, Paul noted that other advocates include “former heads of the CIA and the Republican and Democrat heads of the 9/11 commission” as well as bipartisan members of the House who are working to advance H.Res.14, which likewise urges the release of the 28 pages. In an interesting twist, Paul announced his intention to next week offer the language of the bill as an amendment to the defense authorization bill. A similar maneuver was twice attempted in 2003 by then-Senator Byron Dorgan. Interestingly in note of last week’s high-profile clash over NSA surveillance, Dorgan’s effort was stymied on procedural objections initiated by Mitch McConnell. 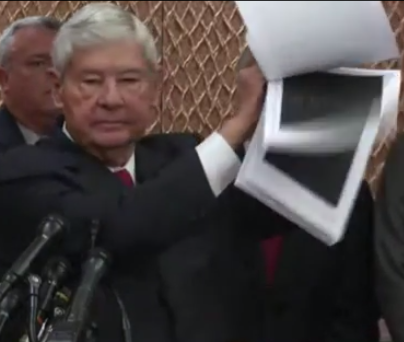 At the press conference, Paul was joined by three congressmen who are leading the 28 pages effort in the House of Representatives—Walter Jones (R, NC), Stephen Lynch (D, MA) and Thomas Massie (R, KY)—and former Democratic Senator Bob Graham, who co-chaired the intelligence inquiry that produced the 28 pages. 9/11 family members also spoke, including Terry Strada, national chair of 9/11 Families and Survivors United for Justice Against Terrorism. Graham offered a highly visual example of that pattern of withholding, describing a request made to the Treasury Department for information it had on a Saudi-based foundation suspected of funneling money to al Qaeda. The Department of Justice responded by distributing a report summarizing what it knew about the foundation. Holding a think bundle of paper aloft, Graham said, “Let me just show you what the report said.” He thumbed through perhaps a hundred pages—all of them entirely blacked out. Lynch also said he shared Jones’ frustration with the low support of the 28 pages resolution in the House and the difficulty in persuading members to read the 28 pages for themselves. Congressman Massie said the 28 pages represented a bipartisan issue. “Unfortunately, it is bipartisan in two regards. You have Republicans and Democrats in the House and Senate who are leading the charge to release these pages, but you have two presidents, either of which could have released them: A Republican president who is the reason that they are secret, and a Democratic president who keeps them secret,” said Massie. According to The Hill’s Julian Hattem, only 25 House members requested permission from the House intelligence committee to read the 28 pages over the 24 months that ended on December 31. Seventeen have done so in the first five months of 2015.